A beautiful piece of Polish Hill history is experiencing a second life as an all ages performance venue. 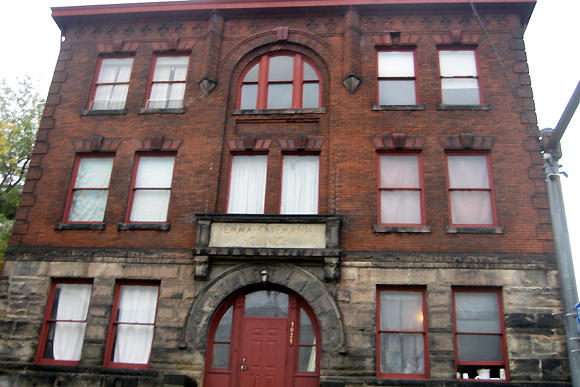 The stately building at 3028 Brereton Street once housed the Emma Kaufmann Clinic, later served as the headquarters for the Pittsburgh branch of the Polish Falcons, and on October 9 had its grand opening as The Red Theater. The building is owned by Architect Stephen Mesich, who lives in the building and rents space out to artists. Mesich began hosting scattered musical performances out of the building’s 1600-square-foot upstairs social hall last year, but it wasn’t until five weeks ago that The Red Theater was cemented as a serious alternative music venue for a wide variety of artists when Mesich teamed up with event promoter Sardonyx Productions. The venue boasts a large 19th century concert hall with a 12-foot-deep stage and room for up to 300 people. Rich architectural details include a 35-foot ceiling, colorful lighting, and a spacious bar serving non-alcoholic beverages. “A lot of parents don’t want their kids going to an alcoholic place, and we want it to be a good place for young kids to see live music. Parents will feel a little more secure about that,” says Mike Moscato, owner of Sardonyx Productions. Sardonyx Productions has already produced two shows at The Red Theater and has two more scheduled in the coming months. On November 24, The Thanksgiving Eve Hip Hop and Rock Party will star rapper Ego. On December 24, a Christmas Party featuring The Long Knives, Dante Romito Band, and Sean O’Donnell will take place. Both events begin at 7 p.m. and cost $10.